If your memory of taking vitamins as a child involves a small, chalky version of Fred Flintstone, you are not alone. 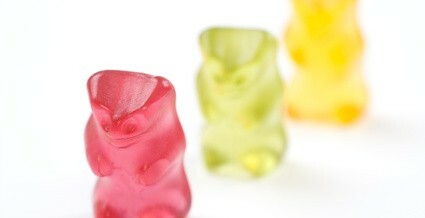 Today, gummy vitamins have become the most popular form of multivitamin for both children and adults. Many choose the option of getting essential vitamins, minerals and nutrients in a small, yummy treat. As a parent, it is important to know that these gummy treats contain many of the same ingredients as traditional candy. Glucose syrup is a common ingredient in this type of vitamin and glucose syrup is essentially just sugar. Sugar-free gummy vitamins are available but often contain other ingredients which have the potential to harm teeth. The best choice for all children is to receive nutrition from as many real food sources as possible, including fruits, vegetables, and protein. Try to ensure that your child consumes well-rounded meals to obtain the required daily vitamins, not just for his or her oral health, but for overall health, as well. For many children, this type of diet isn’t always possible and a vitamin supplement can be used to help with overall nutrition. When you try to decide what is best for your children, consider not only what type of vitamin you are giving them, but also how you are giving it to them. If you have a picky eater whose diet may be lacking certain vitamins and minerals and you choose to give a daily multi-vitamin, try to give it at a time when you know the teeth will be brushed within a short period of time. For example, give the vitamin shortly before nighttime brushing. Regardless of how sticky the vitamin is, a good thorough brushing will remove potentially harmful debris from the teeth and greatly diminish the risk of cavities.